1) An intentional peaceful space in your home is something to cultivate and cherish. Our kitchen/diner is the central hub of our home. It's the first room we go into in the morning and usually the last place that we turn off the lights at night. It's where we make food, cook, eat, do homeworks, draw, work, entertain etc. It is the buzzing, busy core of our family living space - a room that is so happy and alive, but is also the epicentre of our chaos. One thing that has brought us loads of joy is being able to have another room that is free from that atmosphere of busyness. Not having a T.V. in our living room opened it up to be a really safe, sacred space for us to relax as a family without extra noise or clutter. We were able to get rid of all the furniture we felt only suited the room because it was pointed at the T.V. and were able to think carefully about how to lay it out to foster conversation and relaxation. We got this 4 seater sofa from DFS, got rid of our big T.V. table, we sold our second sofa because it felt too clunky and we had our big footstool recovered. Having a comfortable sofa really gives the room a warmth and a welcome that is needed and we are loving that our new one is really stylish and cozy. Add in some plants, artwork, blankets, candles and a handful of toys on rotation and it has become a haven for the end of the day. Don't for a second think that it's all snuggling and reading books together by the light of a tapered candle - some chaos happens here too (and a lot of wrestling matches). But mostly this is now where we come when we all need to unwind from the noise of life and be a little more tuned in to each other. 2. Eliminating incessant advertising is good for your soul (and your wallet). One of the driving factors for kicking our T.V. to the curb was how much we noticed that excessive advertising was creeping into our lives and making us a bit unnerved. Levi was constantly asking for new things and we tended to default to having the T.V. on in the background of our daily lives - letting all kinds of messaging and advertising into our space without much thought of the impact. Without it, we have taken back some control over what we take in and for that I am grateful. We still use our phones/tablets/laptops to watch Netflix (which doesn't have any ads) and playback TV (we pay a T.V. license so we can still tune into mainstream programmes when we choose to) but that's now on our own terms - no more passive consumer messaging. Levi isn't half as aware of the toys and gadgets that he may or may not be missing out on because endless adverts aren't thrust in his face every five minutes. We are able to be more purposeful about what we watch - only consuming T.V. shows that we really want to watch instead of the endless drone of background telly. It's just easier to tune that stuff out when it's not an option anymore. 3. Kids need the opportunity to be creative. It's in them to discover. One of the best things about eliminating the T.V. option from our home has been how much it has brought out Levi's creative side. I don't know if he was always going to be a creative child but not having the distraction of constant T.V. has given him loads of space to use his imagination. There is not a day goes by that he isn't up at the kitchen table surrounded by stacks of paper and colouring pencils, crayons, glue and scissors making something. It is an absolute joy to watch and inevitably we get roped into his creations too. I ended up getting him a big wooden caddy from IKEA to store all of his supplies in and it never leaves the kitchen table - always armed with all of his tools to create something on the daily. One week my dad and him made an ice cream machine out of a box and he brought it in for show and tell in school. His teacher loved it and had him go up to the Principals office to show it off and the PRIDE on his face when he came home to tell us. I say that not to be smug, but to really appreciate the way that Levi has adapted to limited amounts of screen time. Sure, he gets a tablet handed to him at 6.15am when he wakes up ready for the day - I beg you to find a parent that isn't using the gift of technology to snag an extra half hour (hour) in bed, half-awake and longing for the good old days of a lie-in. He also loves to curl up on the sofa with his tablet and watch Netflix after school to wind down and we are really relaxed about that. What is beautiful though is that he now has the ability to regulate his own screen time and takes initiative to turn off his programmes when he's had enough and sit up at the table and draw or make things. I feel like despite all of the things that go wrong or are frustrating about parenting throughout these sometimes long days - there are things worth being proud of and this is one of them. I don't think he would be half as inclined to do this if T.V. was still an option for him. I have even managed to chill the hell out about the mess he makes in the process because I know that it's so good for him to be free to create. 4. People notice and are drawn to the peace. I love having people in our home - new friends, old friends, neighbours and family. Our home is for sharing and I want it to always be a welcoming place. When we first got rid of the T.V. I was really aware that other people might find it weird and I was even worried that my parents would hate babysitting for us because there was no T.V. but the opposite is true. So many of our friends and family have either not even noticed that we don't have a T.V. or have been really struck by how peaceful our living area is now. They love retiring to the front room after a Sunday roast or a day of taking care of our kids because it's the space where all there is to do is relax. No dishes or fetching for little ones, just stopping and being together. I love bringing people into our living room, lighting the fire and cozying up on the sofa for a good night of catching up. Not having a T.V. blinking in the background creates a really level, open space for real conversation and honesty - no diversions or distractions. 5. We are not missing out. Ok, fine. There are times when all I want to do is watch Catastrophe or one of our favourite box sets on a bigger screen but those times are few and far between. There are still lots of ways that we can (and do) indulge in on-screen entertainment so we really don't feel like not having a T.V. has limited us in any way. We are much less likely to tune into something when it's on in real time because we aren't as aware of when shows are scheduled but in this day and age of catch-up telly, we can always go back to find something if we really want to watch it. There is so much choice now in terms of what to watch and how to watch it that we are really spoiled. Maybe had we done this before the days of Netflix and NOWTV or similar outlets it would be different but I'm more than content not to know who is making a fool out of themselves on X Factor this year. We are still trying to make sure that we don't gravitate to our phones too much in replacement of mindless telly watching. I feel like that's something we will always be working on as these little mini computers in our hands draw us to distraction more and more. Let me finish by saying that there is nothing at all wrong with television. It's a real gift to be able to learn and be entertained by technology and I would be a huge hypocrite if this post came off as a righteous rant about the perils of T.V. It's not. Removing the physical object from our main living space has, however, opened up a whole new way for us to connect and be creative. 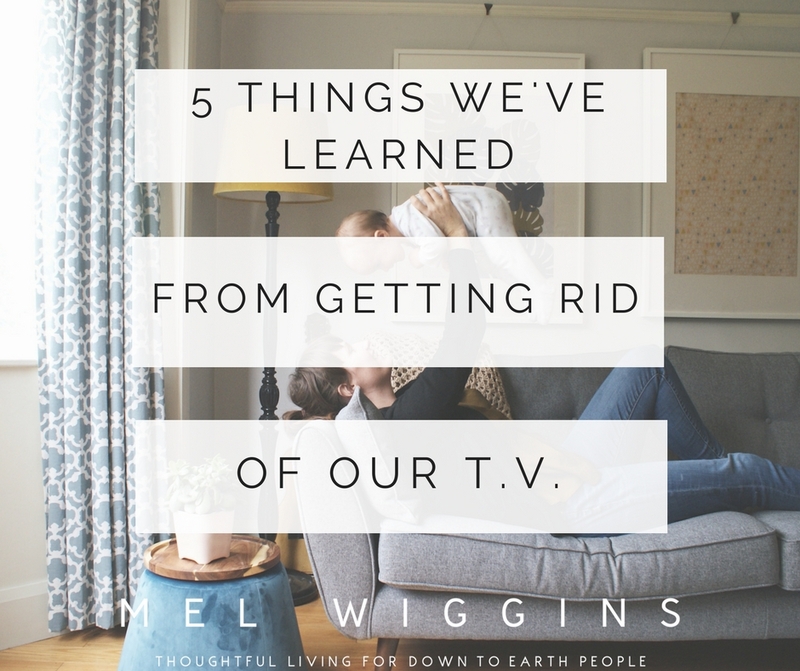 It has forced us to be intentional about our consumption of T.V. and given us back a space in our home that is a peaceful and quiet in the midst of our busy lives with little ones and for that I am grateful. So tell me - would you ever consider giving up the T.V. in your home? Is T.V. a big deal in your house? How do you think your family would feel if you decided to remove it for a while? Would love to hear your thoughts and experiences so do leave me a comment! With thanks to DFS for sending us our lovely new 4 seater Zinc sofa in collaboration with French Connection to enjoy in our living room.